A pattern to make shoes for your Gene Marshall doll. This page was created to make shoes for the 'Gene' doll using the shoes that come with the doll as the base for the new ones. 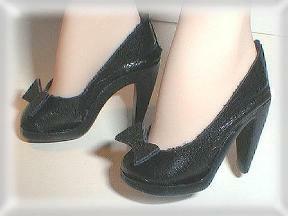 I created the pattern on request because so many people were disatisfied with the shoes from Ashton Drake (AD). this page takes a few minutes to download, so be patient. BP: This pattern calls for the use of an AD shoe base. Using a small screwdriver pop the insole out by forcing the end of the screwdriver under the insole at the indentation. Gently pry back to the heel. 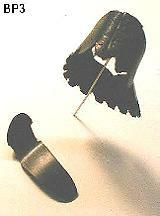 Try not to break off the peg that fits into the heel end. 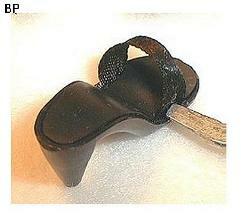 The peg helps to stabilize the two pieces when they get glued back together. BP1: Before cutting out the paper pattern, paste the pattern on to a thin sheet of poster board or other thin cardboard such as the inside of the front cover of a notebook. This makes the pattern easier to trace around and insures that you will be able to use it many times. Cut out the pattern on the solid lines. 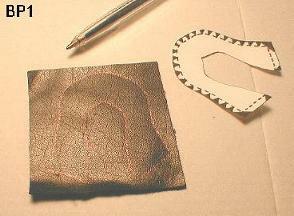 Trace it on to the right side of the leather using a regular ball point pen. The pen will show up as a faint red mark on black leather. Cut inside the ink lines so no ink is left on the leather. 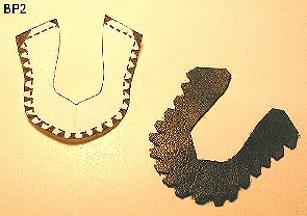 BP2: Using a small very sharp pair of scissors clip out all the tiny triangles of black as marked on the pattern. This allows the leather to be glued down without any excess bulk. BP3:Fold one edge of the back opening over and glue down to the inside. Overlap and hand sew the back seam using a small thin needle, such as a quilting needle. The best glue to use is "Duro Fast Drying Contact Cement". It comes as a liquid in a brown glass bottle and is available at any paint shop. K-Mart carries it also. Use flat toothpicks to spread it on the leather. BP4:Glue the points down to the bottom of the plastic insole. It works best if you put a layer of glue on both surfaces and let it dry a little first. Put the shoe on Gene's foot to get a perfect fit, manipulate the leather before it has totally dried. Work quickly, it dries fast. 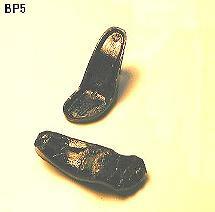 BP5:Spread glue generously on the bottom of the insole and the inside of the base. Press firmly together. The front can be left plain or decorated with the leather bow. 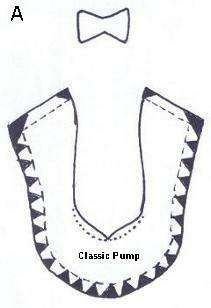 The Patterns: The shoe pattern for the pumps should measure exactly 2-3/16 inches to get an accurate fit. It has 2 cutting lines for the front, I used the round (dotted line) for my example. 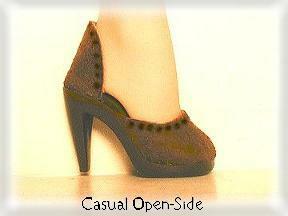 The open sided shoes use the same basic directions except of course there is no seam down the back. 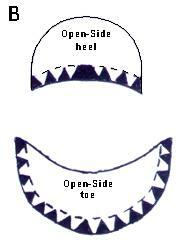 Just center the pieces on the toe and heel of the plastic insole. 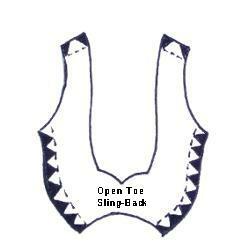 The Open-Toe Sling Backs would work well in light or bright colors to use with summer outfits I think. Thin dress leather, thin suede, or ultra suede can be used to make any of these shoes. These instructions and patterns prints out as 3 full pages with the patterns on the 3rd page if they are all you want to copy. Marsha Olson and "The Right Hatmosphere"
patterns are not to be sold or used for commercial purposes! Spring and Summer Hat Collection? Robbin's "Fine-Things" Jewelry For Gene?